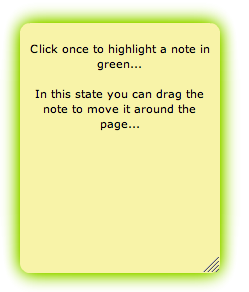 You can change the page on which a note appears by selecting it - click once to highlight the note in green. In the toolbar at the top of the StickyNotePages app, use the Page drop-down menu to change the location of the note. If the pages have been renamed by the Host, the correct names for each page will show here.